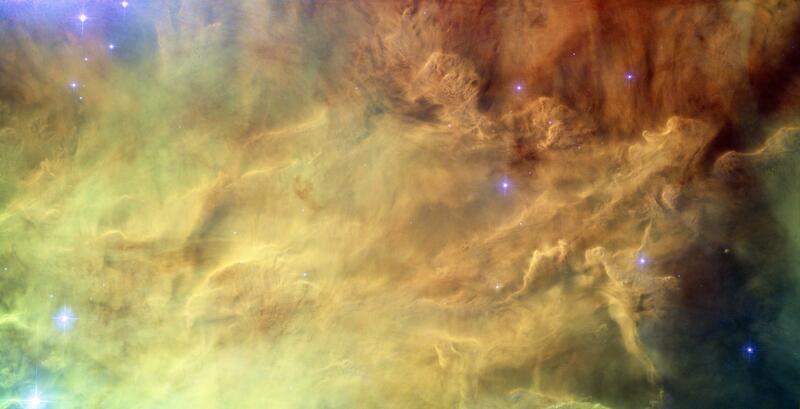 The Lagoon Nebula is one of the more famous objects in the sky. It’s a big, bright gas cloud easily spotted using binoculars in the constellation of Sagittarius, and through a telescope reveals quite a bit of detail. I’ve seen it literally hundreds of times, observing in the summer when Sagittarius is up. You can even see it in a picture [I took a few weeks ago] (if you’re really curious, scroll to the bottom, click the pic of Sagittarius, and then look off to the right of center; the compact fuzzy pink thing is the Lagoon). As you might expect, I could go on and on about what you’re seeing here: dense clouds of gas and dust, star forming regions, shock waves, and the like. Instead, though, I’ll direct you to the four bumps, like a wave going across the nebula from left to right and downsloping a bit. Take a look at that third one from the left. Does it look familiar…? Oh _yeah!_ Giggity giggity lagoon! For those of you who have no idea what I’m talking about because you are even older than I am, then just assume it’s really Bob Hope. Or Nixon. Or given that eyebrow ridge, Neanderthal Nixon. I’ll stick with Quagmire, though. But not too close. Because, y’know. Ewww.